Brasso & Hat Rack together at Kapiti Playhouse - Kapiti Playhouse Inc. Please Note: Due to low ticket sales, this concert has been cancelled. 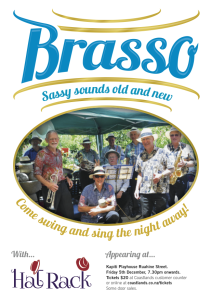 Local Kapiti band Brasso will be appearing on the stage of the Kapiti Playhouse on Ruahine Street on Friday December 5 at 7:30. They will be supported by another local band, Hat Rack. Brasso is an all-acoustic group of musicians who originally met up playing with the Kapiti Brass. This 10-piece ensemble is composed of experienced brass players, supplemented by an alto sax and a drummer and percussionist. Brasso is often seen and heard around the Kapiti Coast, playing at venues such as the Kapiti Food Fair, the Kapiti Miniature Railway, the Kapiti Music Festival, seniors’ residences, and other important community events and private parties year round. The goal of the band is to have musical fun by bringing brass band music kicking and screaming into the 21st century. They play in a variety of styles including swing, jazz, latin, rock, blues, and pop. The repertoire has been custom-arranged for this unique group to include music all the way from the 40’s and earlier, right up to last week. They say that they will play anything that sounds good with their instrumentation, from Glenn Miller through Michael Jackson to Pharrell Williams. Several original tunes make the sound even more special. Check out Brasso on their Facebook page. Hat Rack is a local band formed in 2013 combining strings, brass, wind, percussion, keys with many and varied vocals. They have a wide repertoire spanning the last 7 decades of ‘big’ popular songs that appeal to many ages. JJ Cale, Frank Sinatra, Johnny Cash and Blues Brothers to name a few. To date, the band has provided music for clubs, pubs, music festivals and several private celebrations. Tickets for the December 5 performance can be bought for $20 at Coastlands customer counter or online via the TicketDirect website. There may be some sales at the door but seating is limited.